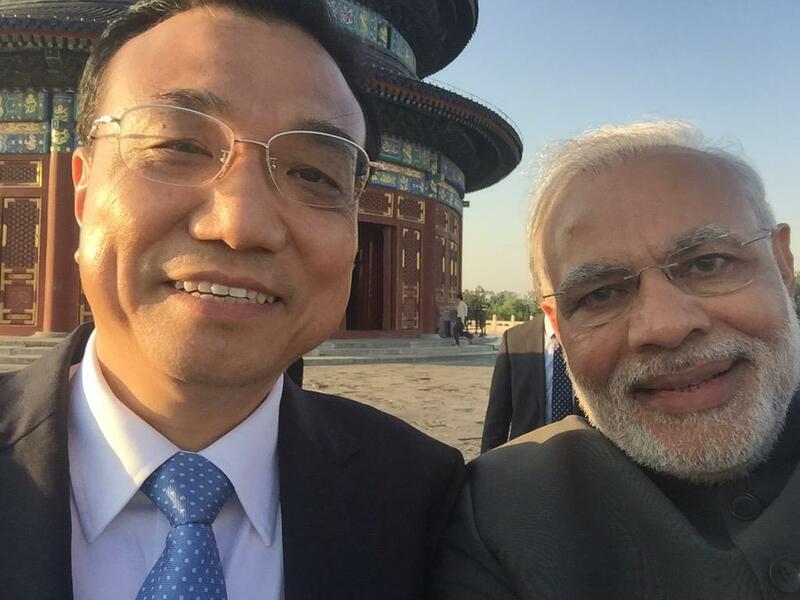 Beijing(WSJ): The prime ministers of the world’s two biggest countries leaned on each other Friday for what may be the most politically power-packed selfie in history. Indian Prime Minister Narendra Modi pulled out a smartphone during his visit to Beijing’s Temple of Heaven, extended his arm and cozied up with Chinese premier Li Keqiang for the shot. It's selfie time! Thanks Premier Li. That put two of the most powerful people in countries with a combined population of around 2.5 billion people—more than one-third of humanity– in the same frame with no official photographer involved. Mr. Modi’s people quickly tweeted photo. They carry on a new and sometimes criticized tradition among world leaders for self-shot images. In 2013, U.S. President Barack Obama and Britain’s Prime Minister David Cameron posed for a selfie with Denmark’s Prime Minister Helle Thorning Schmidt at a memorial service for Nelson Mandela in South Africa. The image was criticized by some who said it lacked the gravitas required for such an occasion. If you’re already famous, selfies can make you even more so. The tweet, which the 2014 Oscar host, Ellen DeGeneres, sent out during the broadcast with the help of stars like Meryl Streep, Bradley Cooper, Jennifer Lawrence, Lupita Nyong’o and Brad Pitt, received more than 921,000 retweets in less than 40 minutes. It went on to get more than a million retweets and counting. 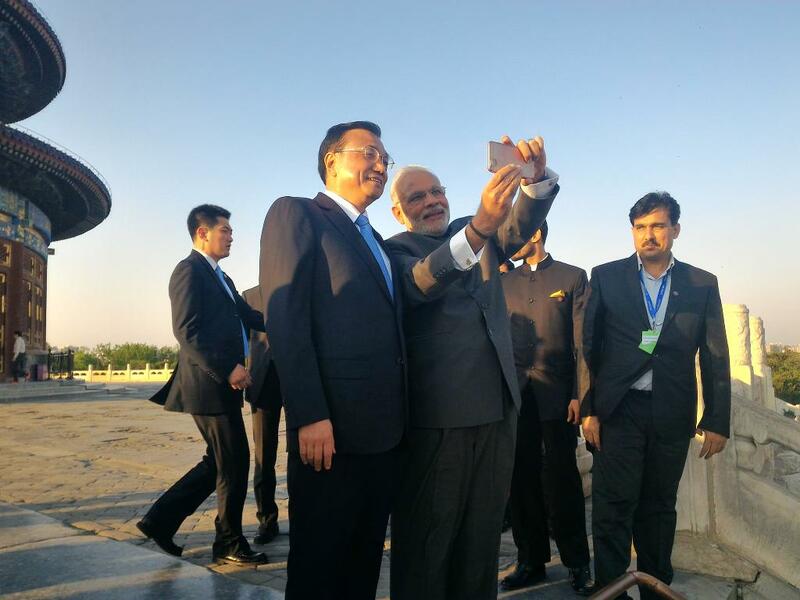 Mr. Modi is no stranger to selfies. He used one in his 2014 election campaign and was the first world leader to use to Twitter Mirror, an exclusive app, usually the province of pop stars and red carpet types, that produces autographed selfies and posts them to Twitter on his tours. Here he is using it with Australian Prime Minister Tony Abbott during a visit to his country in November. Mr. Modi knows the power of using technology for self-promotion. 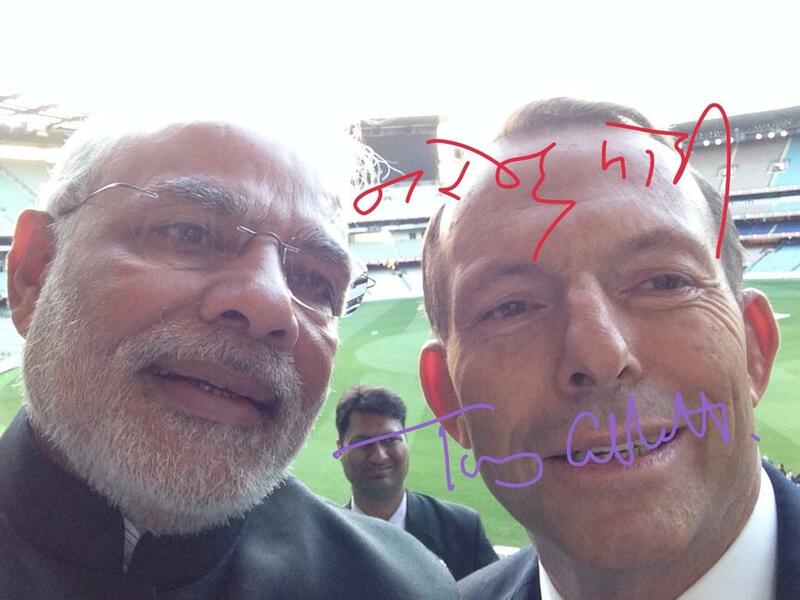 With my friend @TonyAbbottMHR at the MCG. In the run up to state elections in Delhi in February, his Bharatiya Janata Party launched its “Selfie with Modi” campaign to reach out to voters keen to have their picture taken with the prime minister. He didn’t spend his day with a selfie stick though, the pictures were the product of a special smartphone app taken in more than 1,000 selfie booths in shopping malls and parking lots across Delhi. In the first week they collected 70,000 images.